In this wide-ranging and engaging collection of interviews, Brian Brock discusses how Christian faith makes a difference for life in the modern world. Beginning with a discussion of teaching Christian ethics in the contemporary academy, Brock takes up environmental questions, political and medical ethics, the modern city and Christian responsibility to it, energy use, the information age, agriculture, political consensus and coercion, and many other issues. The reader is thus offered a broad and incisive discussion of many contemporary topics in a brief, illuminating, but never superficial manner. The book's unusual conversational style allows strikingly clear, creative, and concrete theological connections to emerge in the spaces between moral questions rarely thought of as linked. As the titles suggests, the running theme of the interviews is being bound to Christ and placed into the contemporary world. Brock's theological readings of contemporary cultural trends are vigorous, unapologetic, and insightful, and they offer delightful surprises as well as fertile new ways through the sterile impasses of many issues currently being debated in the public square. 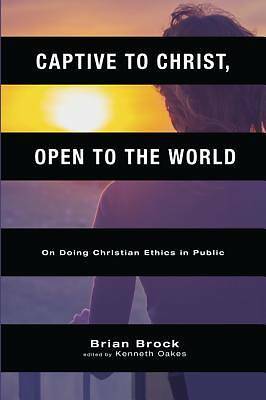 This book provides an excellent starting point for those interested in fresh theological insights into contemporary ethical questions and an accessible introduction to Brock's previous works. ""This book invites readers into an ongoing conversation with an engaging and brilliant thinker who makes us think long and well about Scripture, technology, the environment, politics, and more besides. Reading this book feels a bit like I'm sitting across from Brian at a cafe, sipping coffee and having a robust conversation about crucial questions--questions that ultimately ask, 'How will I respond to Christ with my whole life?'"" --Jana M. Bennett, University of Dayton, Ohio ""These interviews give us a chance to listen in as an erudite and nimble-minded theological ethicist responds to the gamut of issues in our world. Brock advocates an open and unguarded type of Christian engagement in culture, and in this little book the medium fits the message. We can't ask Augustine, Luther, and Bonhoeffer how they would respond to the cultural, ecological, and technological issues of our time, but we can listen to Brian Brock think on his feet about what is to be learned from them and from Scripture."" --Fred Sanders, Torrey Honors Institute, Biola University, La Mirada, California ""What a joy it is to sit in on a conversation with someone who 'grew up in a little Bible church in an industrial backwater in Texas' and who now calls an ancient Scottish university his home. Brian expresses a great delight employing his profound Christian faith to engage the world. Anyone who reads this book is in for a great delight. . . . "" --John Nagle, University of Notre Dame, Notre Dame, Indiana Brian Brock is Reader in Moral and Practical Theology at the University of Aberdeen. He is the author of Singing the Ethos of God: On the Place of Christian Ethics in Scripture (2007) and Christian Ethics in a Technological Age (2010), and editor of Theology, Disability and the New Genetics: Why Science Needs the Church (2007) and Disability in the Christian Tradition: A Reader (2012), both with John Swinton. Kenneth Oakes is currently a Postdoctoral Scholar at the University of Notre Dame, having previously been a Postdoctoral Fellow at the University of Tubingen. He is the author of Karl Barth on Theology and Philosophy (2012) and Reading Karl Barth: A Companion to The Epistle to the Romans (2011). His articles and reviews have appeared in journals such as Modern Theology, International Journal of Systematic Theology, and The Thomist.